Panasonic's New Ultra-Accurate 3D Profilometer | OhGizmo! AI Playing Super Mario Bros. – Dude, This is FAST! By Andrew Liszewski on 08/05/09 • Leave a comment! On the outside it may look like a non-descript industrial box, but Panasonic’s new ultra-accurate 3D profilometer has some pretty impressive technology to boast about on the inside. Thanks to a specially-developed new probe the machine can measure the surface of 3D objects, including microscopic pores at least 50µm in diameter, with an accuracy of ±0.15µm. When the object is being ‘profiled’ the probe touches it with a force of just 0.3mN, which is the equivalent to the amount of force caused by a mosquito landing, and the measurements are conducted at a blistering speed of 2mm per second. Other advancements include improved anti-vibration performance thanks to Panasonic’s vibration analysis technology, since you don’t want the probe bouncing around when it’s doing detailed measurements, and an overall reduced footprint making the machine about 50% smaller than its predecessor. 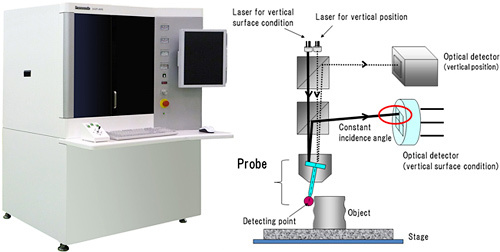 The new 3D profilometer will be available for order starting in October in Japan, and is expected to be quite popular in the automotive and electronics industries where high-precision components are essential.